Cigarette Box Astrology Pt.1 - ThaBadbrey Herbal. This edition shall encapsulate as well as elaborate briefly upon the symbolism and/or geometric representations, found upon the familiar outer packaging of the (in)famous “Golden Cigarette Box”, in an astrologically-explanatory fashion, as per usual. Without further introduction, I shall go immediately to the crux of this “Astrology Bite” and delve straight in at the “deep-end” of the spectrum. Seen below, is an image of a Golden Cigarette Box, shown in a somewhat “half opened” state. The first “Aspect” to note about the appearance of the packaging shown in the above image, is the fact that the box is a golden colour. If you are familiar and/or have read the “Astrology Bite” which dealt with “The Astrology of the Twix Chocolate Bar“, you would remember that the astrological association of the colour “Gold” is indicative of the “Elemental-Triplicity“ of “Air” within the zodiacal wheel. Although there are indeed three “Air” signs present within the zodiac which can be attributed to the aforementioned colour, in this astrological instance, the “Golden Cigarette Box” can be viewed as being representative of the “Air” sign “Libra”. 1. According to Medical Astrology, the sign of “Libra” is widely known for governing the kidneys. However, in addition to this, “Libra” is also (not so widely) known for governing any and all paired organs or features found within the human body. Without going into too much detail, these include “The Two Ears”, “The Two Eyes”, “The Nostrils”, “The Testicles”, “The Ovaries”, “The Hemispheres of the Brain”, “The Lungs“..etc. Basically anywhere within the human body where two of the same feature, organ and/or biological structure can be found alongside one another, is governed by “Libra”, as this is the sign responsible for the balance between the two “sides” of the human body in terms of spiritual, metaphysical and physical equilibrium. It is generally accepted as fact, that the act of “smoking” involves the use(and moreover, “Damage”) of the two “lungs”, which (as stated above) is governed by “Libra“. 2. The extremely hazardous & health detrimental “pass-time” of “indulging” in the act of “smoking a cigarette”, is more often than not, seen as an act of some type of “pleasurable indulgence”, by a large majority of those who partake in such an activity. Viewed from an Astrological context, an “indulgence” of this form or type is under the rulership of the planet “Venus“, which just so happens to be the ruler of the Astrological sign of “Libra“. 3. Also, “Libra” is a native of the “7th House” as represented within the zodiac. This is the “House” of “Relationships/Relating” & “Socialising(to an extent)”. Most of us are familiar with the designated “smoking” areas that are often found within the workplace as well as many other public areas, usually alluded to in colloquial reference as “The Smokers Corner”. Due to this “Designationary-Title”, those who regularly “indulge” in this act are often caught within the midst of situations, where they may find themselves “socialising” with and/or “relating” to other smokers, as a result of being within close proximity to one another within this area, while they both collude in a “joint”(pun intended) effort to “destroy” their own “lungs“. 4.The “Indulgence” of “smoking” is also very often carried out as a form of escapism and/or stress-relief, for the individual involved. As the “smoker” stands in the “Smokers Corner”, they can often be seen day-dreaming and/or looking up into the sky, as they seemingly “smoke” their sorrows away. The act seems to induce in them, a feeling of “blissful-freedom” for that brief moment in time known to many of us here in the UK as, a “Cigarette Break”(More like a “Nervous-Cigarette-Breakdown” as far as I am concerned…, but that’s just my perspective upon the matter). Excuse my minor “Interjectionary-Rant”(for want of a better expression),… anyway, back to what I was saying…Upon brief observation of two or more “smokers”, you may notice that as they collectively inhale each others hazardous fumes as well as their own, they both seem to exhale, almost as if in unison, as they symbolically blow their troubles (in the form of cigarette smoke) into the “Air“/sky. Both seem to watch their freshly exhaled smoke, as it dissipates into the atmosphere, almost akin to a symbolically metaphoric representation of the escapism that they seem to relentlessly crave, almost as much as the cigarettes they actually smoke. The Cigarettes are packaged in a “Gold(Air) Cigarette Box”. The “Act of Smoking” involves the blowing of smoke into the “Air” and is seen as an “Indulgence“, governed by “Venus“, which rules the “Air” sign of “Libra”, which in turn governs the “Lungs“. 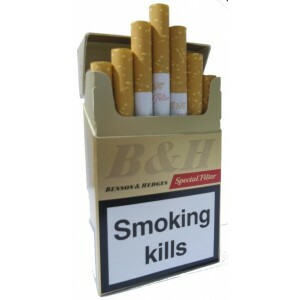 If you count all of the cigarettes that can be viewed in the image of the half-open but seemingly full-box of cigarettes, shown in the picture above and at the beginning of this “Astrology Bite”, you’ll notice that there are actually “seven” that can be seen in total. (Some may accuse me of “Reaching” here, but what is the true nature of this “Reality” that we all seem to perceive in one way or another? Is it not but a “Collective Consensual Reach” of the “Collective Imagination”, self generated by human collective consciousness?…Hmmm)…Anyway….Seven Cigarettes = “7th House” of the zodiac of which “Libra” is a native. The 7th House is also representative of “relating“/”relationships” & “socialising” (In this case, “socialising” with other smokers within an area designated for “smokers”). So much more can be added to this Astrological Interpretation in terms of “The Shape of the Box”, “The Colour & Shape of each individual Cigarette”, “The Polar “Opposition” of “Libra” = “Aries“/”Fire“/The Symbolic Representation of the Burning of the Cigarette”…etc, but since this is “Astrology Bites”, I shall stop here, for now. In Part 2., I shall briefly elaborate upon the points mentioned in the previous paragraph.It will also include an interpretation of how the Astrological sign of “Taurus“, its planetary rulership as well as the Astrological “House” of which it is a native, relates to the act of “smoking”. The geometric shapes seen on various portions of the design of the cigarette box packaging, and how they relate to the various “Aspects” of the zodiac will also be expounded & expanded upon in detail.